The battle lines of the General Elections have just been drawn, with the West Bengal Chief Minister Mamata Banerjee taking the State Vs Centre confrontation to the streets of Metro Channel, Dharmatala. 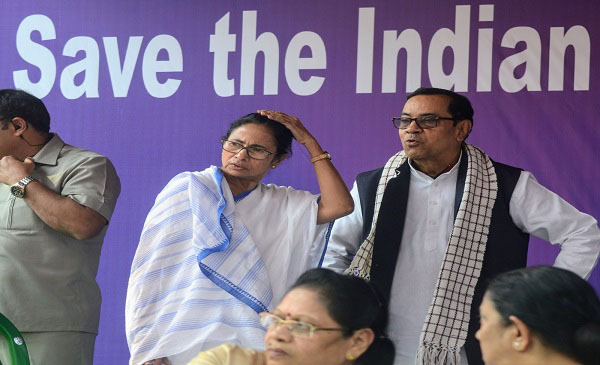 The Trinamool Congress leader is on a dharna against what she calls the centre’s ‘unprecedented authoritarian instincts’ when the CBI officers reached Kolkata Police Commissioner Rajeev Kumar’s official residence at Loudon Street on Sunday evening to ‘question him’. What followed was the unfolding of high tension drama on the streets of Kolkata, scuffle between the state led forces and the CBI and protest by the CM against a political coup. At present Mamata Banerjee is at the dharna manch where the cabinet meeting was held before the state budget of 2019 was presented. The CBI officers, led by its deputy superintendent Tathagata Bardhan, went to the Kolkata Police commissioner Rajeev Kumar’s official residence on Loudon Street on Sunday evening to question him, on the grounds of ‘official work’. The officers were first stopped by the security personnel and then later by Kolkata police personnel from entering the premises. When the CBI officers wanted to enter the residence of Kumar, they were forcibly taken away to Shakespeare Sarani police station in Kolkata by the deployed Kolkata Police team. Meanwhile the state police cordoned off the CBI offices in Nizam Palace and Salt Lake. Five CBI officers were detained and later released. Mamata Banerjee held a closed meeting at Sanjeev Kumar’s residence and later addressed a press conference and announced that she will be going on an indefinite ‘dharna’ against the ‘authoritative regime’ being imposed by the Narendra Modi government. She was quoted as saying, “I am ready to give my life, but I am not ready to bow down. I take pride in my police force.” Soon, Banerjee descended on Metro Channel on Dharmatala, which has an iconic significance – it is here that Banerjee led one of her protests to unseat the 34-year old rule of the CPIM in Bengal. Why is Rajeev Kumar, Commissioner of Police, Kolkata, under CBI scanner? The CBI suspects that Rajeev Kumar, the then head of the special investigation team (SIT) responsible for probing the Sarada scam, is in possession of crucial documents which he had seized during the investigation. After the Supreme Court’s directive, CBI had asked Rajeev Kumar to submit a few documents which were missing from the ones given to them by the SIT. However, even after repeated summons by CBI, Rajeev Kumar refused to present himself before the agency after which the central agency reached his residence to question him. CBI took over the case after the Supreme Court’s order in 2014. They had written to the Director General of Police, WB, Virendra in August, 2018, regarding the appearing of SIT members, who were investigating the chit fund scam before CBI stepped in. However, none of the officials of SIT showed up for CBI questioning. The SIT was formed by Mamata Banerjee in 2013 to probe into the Saradha scam. Later, the Apex Court transferred the investigation process to the CBI. The CBI, which was handed over the charge of investigating the chit fund scam of Saradha by the apex court, claimed that Rajeev Kumar, the CP of Kolkata Police didn’t co-operate with the investigating procedure. Kumar and the SIT members were asked to be present and would be questioned regarding the scam at a suitable time and place. Since SIT members did not turn up, and Kumar failed to turn up, CBI claims it had to ‘storm’ in to the former’s home to question him. Kumar could face arrest for delaying and diluting the probe in the Saradha and Rose Valley ponzi scheme case. Meanwhile, the interim CBI director, M Nageshwar Rao, said, that the probe against Kumar was in accordance with a direction of the Supreme Court. Rao said that the CBI has evidence against Rajeev Kumar, who was reportedly instrumental in causing destruction of important documents and evidence related to the scam. Rao also alleged that the state police machinery had been reluctant in CBI’s probe against Kumar. Since it is an SC order, the central agency needn’t any permission from the state to probe the matter. Rao expressed his concerns over destruction of important evidence. For the Chief Minister of Bengal, the CBI move is being viewed as a “political one” and decided to fight it out politically. Banerjee said on Sunday night, “They (CBI ) came to CP’s residence without any court order or warrant. The matter is subjudice at the Calcutta High Court and there is a stay order. 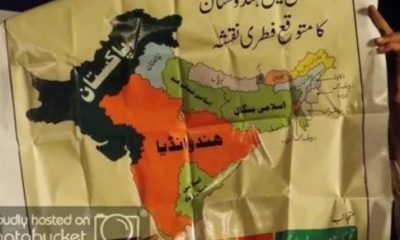 This is blatantly wrong and infringement on federal structure.” Incidentally, after the Election Commission sought an explanation about Rajeev Kumar’s absence from the state home secretary Atri Bhattacharya, West Bengal chief minister Mamata Banerjee issued a clarification tweeting that the officer had been attending office and had taken leave only for a day. What are the options for both the sides? Bikash Ranjan Bhttacharya a senior lawyer of Kolkata High Court and CPI(M) leader, said, “A central agency (CBI) for the sake of carrying investigation as per Apex Court directions desired to interrogate an individual who happens to be the Commissioner of Police. By using government police to browbeat CBI and detain the CBI officers, for sometime West Bengal government has turned it into a crisis. It is to be seen what decision the Supreme Court takes regarding this matter.” According to Bhattacharya, it needs to be seen whether President’s Rule will be imposed in West Bengal. When can the President’s rule be imposed? President’s rule can be imposed in a state under Article 356 of the Constitution of India when the governor certifies that there has been a failure of the constitutional machinery in a particular state. President’s Rule is used sparingly and only as last resort (according to Sarkaria Commission and the Supreme Court). Rajeev Kumar was appointed as the Commissioner of Police in 2016. Prior to this portfolio, he was the Commissioner of Police of Biddhannagar Police Commissionerate. After the Saradha scam occurred, Mamata Banerjee constituted a special investigating team (SIT) comprising officers from West Bengal police to investigate the matter in 2013. Kumar was made the head of the SIT. The Rose Valley scam is worth Rs 15,000 crore and Saradha scam is about Rs 25,000 crore. In both these cases, the ponzi scam companies duped the depositors and refused to return money after the amount ‘matured’ and finally closed down their operations. The Supreme Court handed over the probe to the CBI in 2014. In the aftermath of the scam, the West Bengal government constituted Shyamal Sen inquiry commission to investigate the collapse. The Union government, through the Income Tax Department and Enforcement Directorate, launched a multi-agency probe to investigate the Saradha scam and similar Ponzi schemes. In May 2014, the Supreme Court of India transferred all investigations of Saradha scam and other Ponzi schemes to CBI. Many prominent TMC leaders were arrested for their involvement in the scam including Kunal Ghosh, Srinjoy Bose, a top football club official Debabrata Sarkar, former sports and transport minister Madan Mitra and Tollywood actor Tapas Paul.